On October 6, 2017, the government issued a new rule and admitted what it should have said all along: that it violated the law when it tried to force religious ministries like the Little Sisters to violate their faith. Under the new rule, the federal contraceptive mandate will remain in place for most employers and will now include an exemption for religious ministries. The rule fulfills the Supreme Court 2016 ruling and the President’s Executive Order, but it may be changed after the government considers the comments it receives. The Little Sisters still need permanent court protection to finally end their years-long lawsuit and go back to serving the elderly poor. Now it is time for the government's lawyers to admit that the old rule violated the law and wrap up the legal case. The new interim rule moves the Little Sisters one step closer to finally being able to return their full attention to their mission of serving the elderly poor. As the Little Sisters have argued all along, 1 in 3 Americans do not have a plan subject to this mandate, and the government has already exempted plans covering large corporations like Exxon, Chevron and Pepsi. Under President Obama, the government admitted that there are plenty of other ways to access these services, options already available for the tens of millions of women in exempt corporate and government plans. The unanimous decision by the Supreme Court was a big win for the Little Sisters. But that does not mean anyone lost. As the Little Sisters have argued all along, the ruling in no way bars the government from providing these services to women who want them as long as the government stops trying to take over the Little Sisters' health plan. In fact, any alternative delivery method the government chooses would likely be able to be applied—not only to women in religious plans—but to the tens of millions of women in corporate and government plans HHS had previously exempted from the mandate. President Obama confirmed that the HHS mandate was unnecessary by affirming that the government was still able to providing the mandated services for free to any woman who wanted them even after the Court ruling protected the Little Sisters from complying with the mandate. 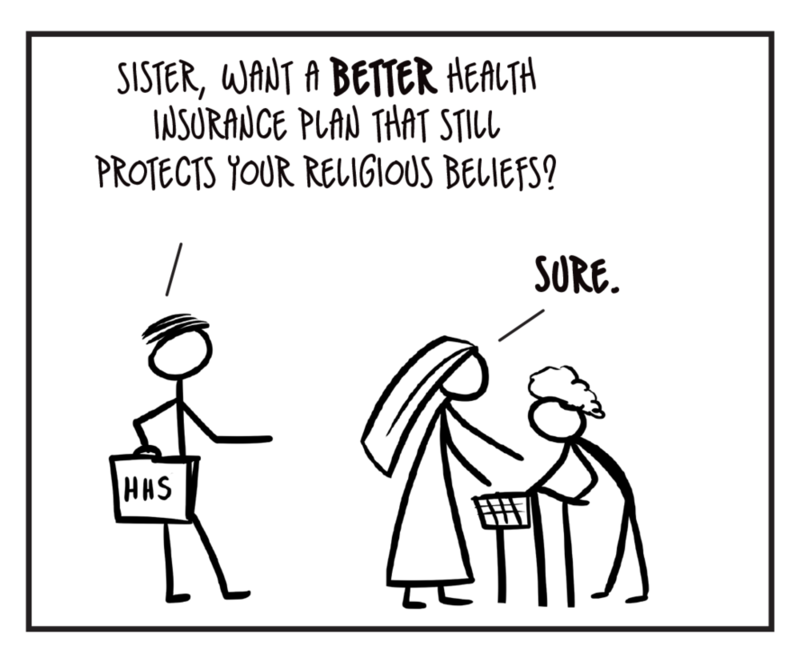 The President’s willingness to acknowledge that the Little Sisters' religious objections have never threatened any woman’s access to contraception -- that women can get that coverage "right now" and can "continue" to get it even without a takeover of the Little Sisters' health plan -- was the natural outcome of the evolution of the government’s argument in this case. Following oral arguments, the government admitted to the Court that it could provide the services in ways other than those required in the contraception mandate. It also admitted that the mandate required the Little Sisters’ participation and the use of their plan. This admission meant the Court did not need to decide on the merits of the government’s original argument that its interests should override the Little Sisters’ religious liberty. With the government’s admission, the path was cleared for the Supreme Court to tell the lower courts to reconsider their rulings in light of the government’s admissions and help ensure the government settled “on an approach that accommodates” the Little Sisters' beliefs. Although the form a final solution takes will be finalized down the road, the unanimous decision by the Supreme Court to overturn the lower court decisions against the Little Sisters and protect religious providers from fines is a big win. And President Obama’s acknowledgment that the government can continue to provide these services without the Little Sisters and their health plan is a major affirmation of the Little Sisters' argument for the last five years that there were obviously solutions and never a need for this matter to have to go to Court. In light of the Court's decision and the President's statements, the Little Sisters are hopeful the government will quickly decide on a workable solution so the Little Sisters can return their full attention to their mission of serving the elderly poor. The Little Sisters had been saying since the case began that there were many other ways for the government to meet all of its goals without using the Little Sisters' plan. 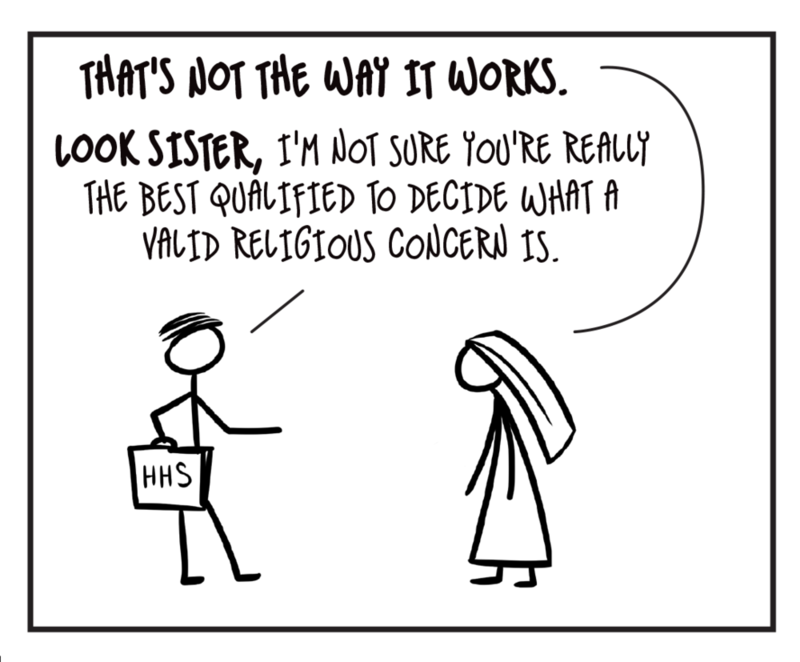 So, when the Court asked if there were other ways and if the Little Sisters would accept them, "Yes" was an easy and obvious answer. But in its final brief, the government argued that contraceptive-only plans—one of the most obvious solutions—were unworkable. This was a bizarre final argument since the federal government currently provides separate contraceptive-only coverage to millions of people through Medicaid (and even referenced this program in its initial SCOTUS brief defending its decision to exempt tens of millions of women with secular employers from the mandate). The fact is that there are a lot of solutions available, including contraceptive-only policies. The Supreme Court has recognized this. And the Little Sisters have always believed it is possible to find solutions that work for all sides. The Little Sisters of the Poor have never sought to prevent the government from providing these services, but have simply asked that the government pick a way that doesn't force them to deliver services—like the week-after pill—that violate their faith. Please keep scrolling down to learn more about the Little Sisters and the facts behind this case. 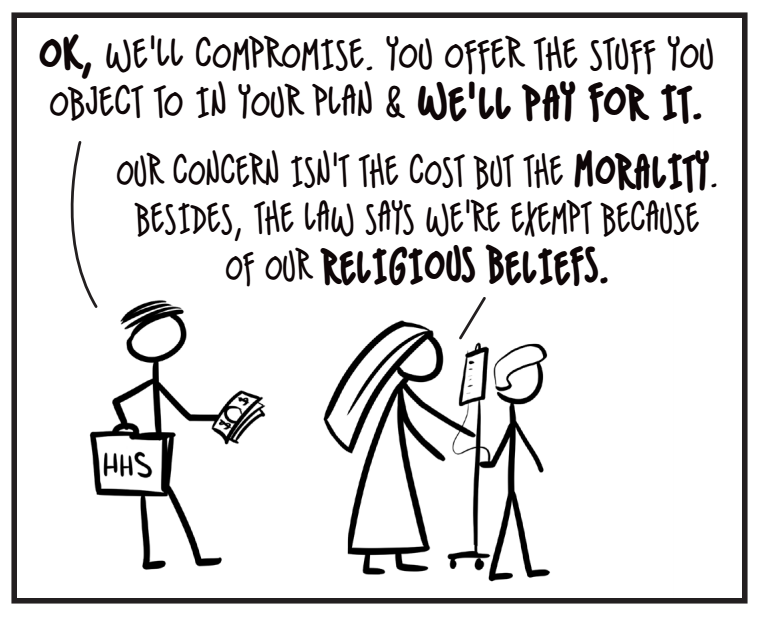 After promising that the Little Sisters’ religious beliefs would be protected, the government created a new regulation requiring the Little Sisters to change their healthcare plan to offer services that violate Catholic teaching or pay $70 million in fines a year. But 1 in 3 Americans do not have a plan that is subject to the mandate HHS is fighting so hard to force the Little Sisters of the Poor to follow. 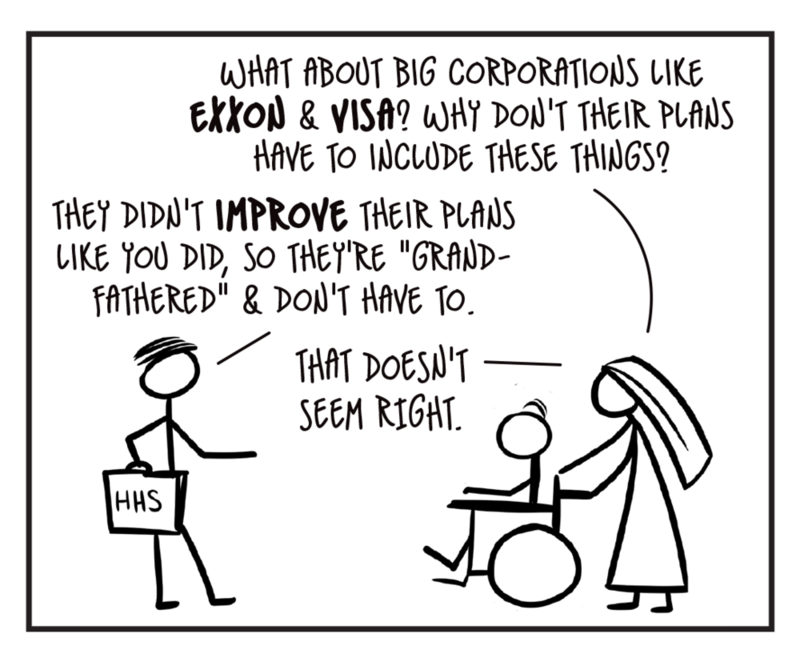 Exxon, Chevron, and Pepsi -- as well as other large corporations -- are exempt from the mandate, because they never changed their plans and are grandfathered. And the government is not even requiring our own US military to provide these services through their family insurance. The Little Sisters of the Poor have dedicated their lives to living with and caring for the elderly poor. They have been focused on service, not advocacy or policy, and, in this case, they’ve exhausted every option possible before going to court. Learn more about the Little Sisters and read their op-eds explaining this case in USA Today, The San Francisco Chronicle, and The New York Times by clicking the button below. There are many easy solutions that protect the Little Sisters’ religious freedom and the right of the government to offer these services to women who want them. 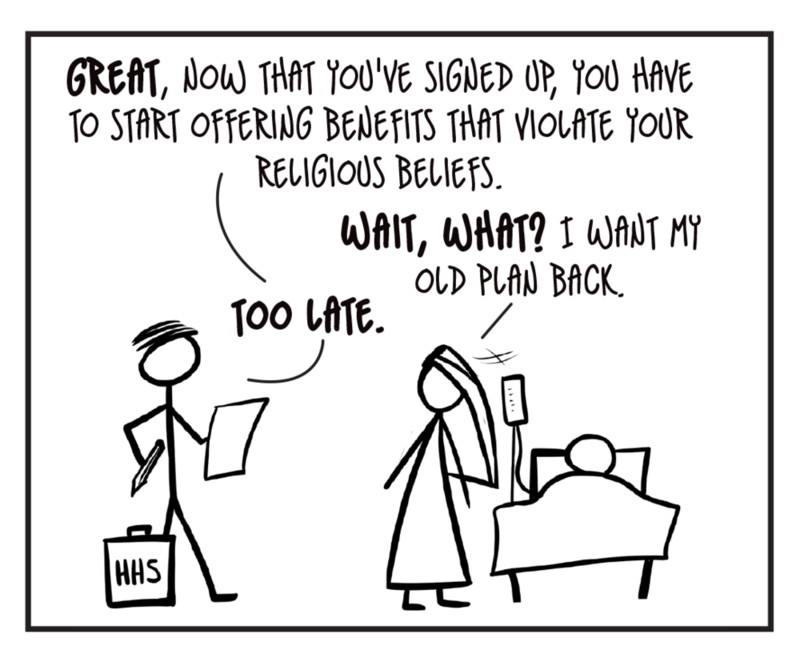 Rather than trying to force religious plans to offer these services, the government could simply ask insurers to offer independent coverage to any women who want it or the government to provide these services through the ACA healthcare exchange to any employees who want them but can’t get them through employer plans. The Little Sisters are not trying to prevent the government from providing these services, but object to the government’s insisting the Little Sisters provide them (especially since the government has already refused to ensure that those free services are provided to one in three Americans). Giving all women access to contraception through one of the many alternatives would be a simpler and fairer way for the government to provide these services to women in protected religious plans and the tens of millions of Americans in other government and corporate plans the government has already exempted from the mandate. And doing so would protect the religious freedom of the Little Sisters, who never wanted this fight and just want to get back to caring for the elderly in need.